In the past, each diamond dealer or jeweler evaluated his diamonds to determine its value. The creation of specialized laboratories in the 70's, which used technical tools for measurement, allowed a more scientific evaluation of the diamonds. This is how laboratories such as G.I.A. (The Gemological Institute of America) and H.R.D. (Hoge Raad voor Diamant) which today have an international reputation were born. The role of these laboratories is to analyze the diamonds and to establish, for each of them a "certificate", which indicates its characteristics: that is ,the 4 C:diamond weight, diamond color, diamond purity, diamond size, as well as its dimensions, its fluorescence, its polishing and its symmetry. Edenly provides with each of its jewels a certificate of authenticity indicating the weight and the quality of the diamonds of its pieces. For certain cuts of particular stones (marquise cut for example), or very large stones, an IGI institute (International Gemological Institute) or HRD certificate can in certain cases be provided to you as double guarantee. 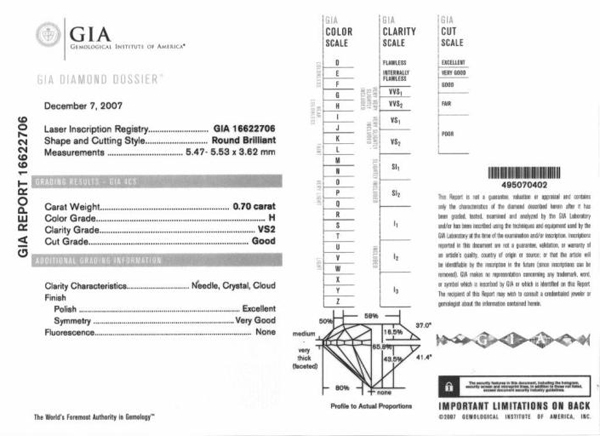 These are so-called "closed" certificates in which the diamond is sealed in a transparent polyester box. But for this to be done, there has to be a written request to the laboratory.